Chop the jackfruit segments into small pieces after deseeding them. Add 1/4 cup water and pressure cook it for one whistle or microwave it for few seconds. We can also cook it in an open vessel for few minutes in a low heat. Remove from the stove and allow to cool. Put it in a blender and make a fine paste. Measure this paste. We have to add equal amount of jaggery powder. For the above quantity we will get one cup paste. So put one cup powdered jaggery in a thick bottomed vessel and add 1/4 cup water and bring to boil. Once the jaggery is completely melted, remove and strain it. In a thick bottomed vessel put the jackfruit paste and add the jaggery syrup. Keep the stove in medium/low flame and stir continuously till both the paste and jaggery syrup blend well. Now add the coconut milk (ensure to keep the stove in low flame)and stir it for few seconds and remove from stove. In a small kadai put the ghee and fry the cashew nuts, coconut pieces and add to the payasam. Add cardamom powder also. Mix it well and serve. Note: Instead of coconut milk, we can add normal milk also. 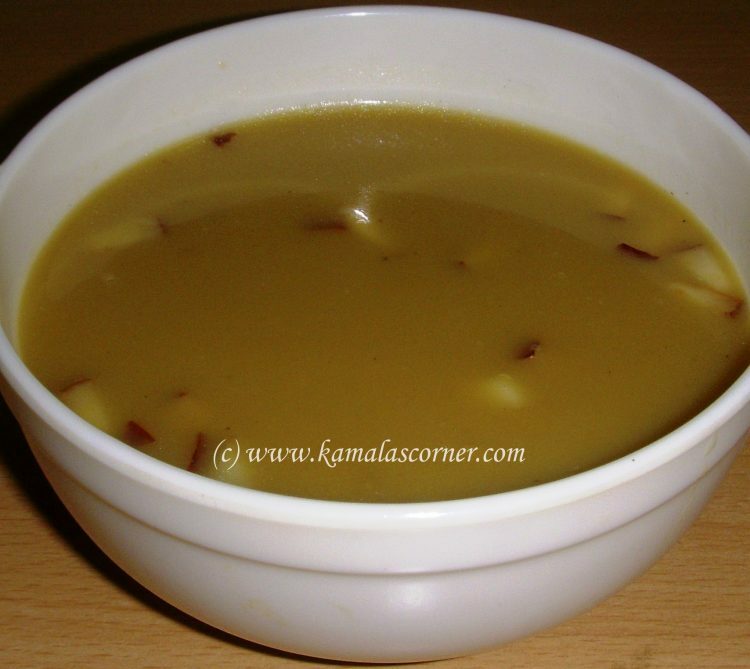 This payasam can also be made from the Chakka Varatti, also known as “Jackfruit Jam”. We have to put some chakka varatti in a pan and add little water to make it semi solid. Then add required milk and make this Payasam.